Torrefied Spruce the natural choice for looks and durability. Not everyone wants a plastic composter in their natural garden. Here's the answer--back to the "good-old-days" - a traditional wood frame composter, but now made from a very long lasting torrefied spruce wood (~15-20 years). This wood has been Torrefied -a thermo/chemical heat treatment that lasts longer than plastic composters and will not be attacked by termites or rot. Easy to assemble: just four side walls-each bolted to each other with 2 bolts with wing nuts - no tools required. No bottom as this allows for easy access for earthworms: the latter are best for making compost. Lid made of wood - making it much heavier than plastic lids - and preventing wind from blowing it away. 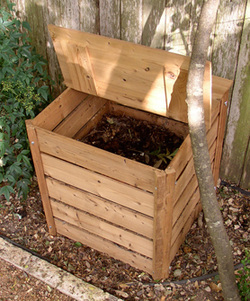 Wood composter looks much better and won't deteriorate as fast as plastic composters. Comes with a 2 year guarantee but wood should last from 15-20 years. Wood is much better for the environment than plastic composters.